I have a very exciting post today!!! Browsing Pinterest a few days ago, I came across a frozen, green, smoothie-type drink called the Green Monster Spinach Smoothie. Intrigued, I clicked through to the original location and found the blog of an “Iowa girl”…hence her blog. This recipe tastes good! I repeat… This.recipe.tastes.good. Basically, it’s banana, peanut butter, yogurt, milk and baby spinach. Blend until smooth and enjoy! I digress. So, I threw in about a cup of strawberries. Altogether, my take on the Green Monster made exactly 24 ounces and 560 calories. I drank half and froze the other. So at 280 calories, this could even be a snack instead of a meal replacement. I’m seriously so excited about this discovery! They taste good, are low cal and packed with stuff that’s good for you! This might become a daily staple for me. I didn’t feel like I was choking down a Slim-Fast or something. It really does taste amazing. 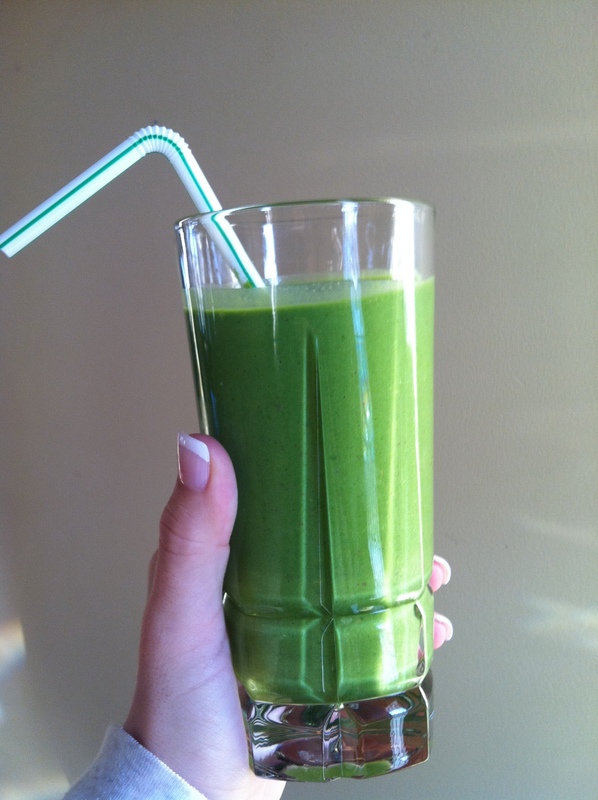 The fresh spinach and fruit gives it a refreshing flavor. And even though the recipe doesn’t call for much, the peanut butter is really good! We keep all of these ingredients in the house at all times (except the spinach…until now) so it was just my style. I’m not into buying a whole bunch of random or exotic ingredients for one recipe. I’m all about versatility and this fit the bill. So happy to have found this! Now go spread your wings but be sure to come back and tell me the changes YOU made! That sounds delish! I love smoothies, but I still am weirded out about putting veggies in them, but with all that yummy fruit, I am definitely inspired to give it a shot! this is a different recipe, I might have to try this one too! Thanks for sharing!